A most unique and special Indian Yantra for owning a desired motor vehicle, like a car, scooter or motorcycle has been described by me in this post. This charm is known in the Hindi language as the Vahan Prapti or the Vahan Sukh Yantra. The Yantra Experiment is most suitable for those people wishing to purchase their dream car or motorbike. The Yantra Experiment has to be started on any Monday by drawing the Yantra, like the one, which has been shown by me in the image on a Bhojpatra using a pointed wooden stick as the pen and Ashtagandha paste as the ink. It can also be drawn on white paper using red colored ink. The Yantra Sadhana has to be performed for 31 days non-stop and in this period of 31 days 5001 Yantras have to be drawn and stored. After the completion of the 31-day Yantra Prayoga, all the prepared 5001 Yantras have to be most sincerely worshipped by offering the Yantras fresh flowers and the lighting of an Oil Lamp and Incense Stick. Finally, to conclude the Tantra Experiment all the 5001 Yantras have to be collectively immersed in any flowing water body, like a river, canal or the sea. Guruji, Tomorrow is Tri pushkar yog. If we make this yantra once tomorrow, then we have to make it two more times in our life ? Please clarify. thank you for the post sir,we have to write the yantra on a single piece of paper or else we can tear the paper into parts and we can write on them?,sir we have to use only red 'ink' pen or red ball point pen will do work?. I am trying for job from long time but not getting success. 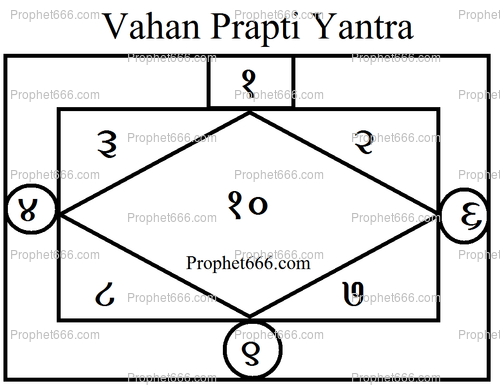 Kindly suggest yantra tantra mantras for same as I am very stressed due to joblessness. I have started doing these yantras but doing so many is proving difficult due to work commitments. Is there a possibility of my wife helping me to draw the yantras by doing some for me then i can worship them by myself? Yes, your wife can help you make the Yantras after, which you can worship them as described in the articles. Dear Neelji, can ladies also do the drawing of the yantra during their monthly cycle? Ladies should avoid preparing Yantras during the Monthly Course.